Are you looking to sell antiquities? Or perhaps you need an expert evaluation of a piece of your own collection? At Kölner Münzkabinett we have many years of experience in trading antiquities. We are able to classify them chronologically and geographically, and to assess their value competently. Furthermore, we have long-standing relationships with a number of external specialists and laboratories, who we can call upon, whenever necessary, for identifying and testing the objects. We buy and sell ancient artefacts of all genres and periods, from Near Eastern and Egyptian to Greek, Etruscan, Roman, Byzantine or pre-Columbian objects. And we would be delighted to feature any interesting ancient artefacts in our next auction. Our catalogues have a reach of more than 1000 collectors and dealers. To ensure the highest possible visibility of your consignments, all items are also offered internationally via sixbid.com. There is no charge for unsold items. If you live in the Cologne area, you are welcome to come by our store with your treasures. We will examine them, assess their value and of course, and if you prefer, we can also arrange the sale. Please note that we only deal in archaeological objects from legitimate sources, preferably those from German or European collections with verifiable acquisition history (acquired before 1980). We do not deal in antiquities from illicit excavations or with dubious provenance! To ensure that the right person to advise you is on site, we kindly ask you to arrange an appointment by phone. Are you fascinated by the idea of owning a piece of the past which you can hold in your hands and enjoy every day? Or perhaps you would like to buy a unique gift for someone who is interested in the history and archeology of ancient cultures and need personal and competent advice? Then you’ve come to the right place! Our shop in downtown Cologne is open every day (Tues-Sat) and we always stock a number of interesting archaeological objects, for example, jewellery, vessels, oil lamps, Roman glass, terracottas, etc. A selection of our stock can also be found in our MA-Shop www.ma-shops.de/koelnermuenzkabinett. All archaeological objects we offer have been checked for authenticity and have proven provenance! If you are looking for a specific object, do not hesitate to get in touch with us. We would be happy to help you with your search, so that you can benefit from our long-standing relationships with collectors and dealers. The Kölner Münzkabinett regularly holds two floor and two e-auctions a year, in which, in addition to coins and medals, ancient artefacts are being auctioned. The spectrum of artefacts ranges chronologically from the Neolithic period to the Middle Ages – in addition to Near Eastern, Egyptian, Greek, Etruscan, Roman and Byzantine artefacts, we also offer selected Islamic, Asian and pre-Columbian objects. Thereby, all major genres are represented: jewellery made of gold, silver and bronze, pottery, glassware, terracottas, as well as stone and bronze objects. All artefacts that we offer are carefully checked for authenticity and provenance! Over 40 years of successful trading Ancient Artefacts in Cologne. Shaped by man – whether hammered from gold, moulded from clay, cast in bronze or carved in stone – ancient artefacts not only provide information on the technical level or the way art was understood in their time, but they also illuminate different aspects of the cultures from which they originate. 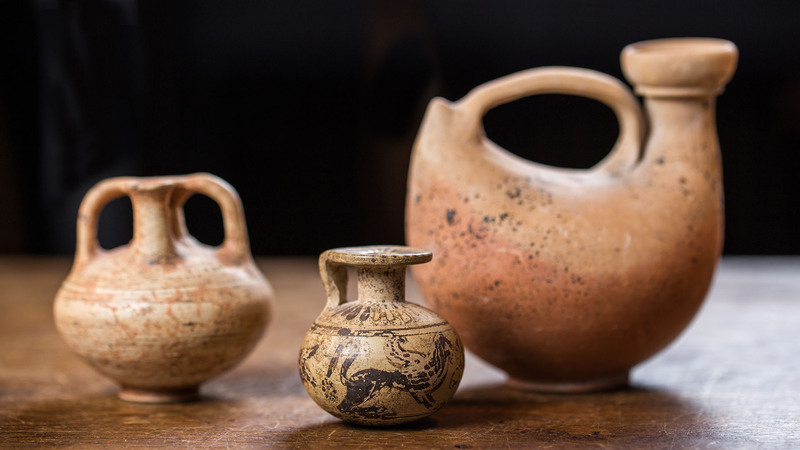 Greek vases as well as Etruscan and Roman ceramic vessels teach us about the impressively sophisticated eating and drinking culture of ancient times. Ancient jewellery, brooches and fibulae can tell us something about the fashion and taste of the time, but also about the gender, ethnic or social origin of the former owner. And terracottas, which often were dedicated as offerings in sanctuaries or given as grave goods, can be testimonies for which gods the people worshipped, which concepts of the afterlife they had, or what fears and diseases bothered them. Archaeological objects reflect ancient life in all its facets and sometimes reveal very personal information. They are able to evoke in us a sense of connection with the ancients, making the past tangible for us. It is the contrast of sensual closeness and temporal distance together with the uniqueness and authenticity that make up the unique fascination of archaeological objects. Moreover, beyond their historical significance they have their very own aesthetics that enchant many collectors: the strangeness of the archaic, the beauty of the classical or the minimalist and abstract forms of other eras, which often seem almost modern. If you would like to own a small piece of the past, you are invited to browse our collection at our store in the heart of Cologne. Do you have questions regarding antiquities or are you interested in buying or selling ancient artefacts?